Who is God? The Triune God-Father, Son, and Holy Spirit. Who is Jesus? We believe He is the Son of God, who also became fully man. We believe He was sent by His Father to earth to be our Savior through His death and resurrection. How are we saved? Through faith in Christ alone. As we believe and trust in Him for our salvation and forgiveness for our sins, we have the promise of eternal life with Christ in heaven. How do we come to faith in Christ? Only through the Holy Spirit working in us through the Gospel and its work in Holy baptism. What do we believe about baptism? Jesus told his disciples to make disciples of all nations by baptizing them and teaching them. We believe all nations includes children. Therefore, we baptize children and adults at Prince of Peace. We believe we actually receive forgiveness for our sins, life, and salvation in baptism and it is something Jesus desires to happen in our lives. It is also a means by which we receive the gift of the Holy Spirit. What do we believe about Holy Communion? We believe Jesus is truly present in, with, or under the bread and wine of Holy Communion in His body and blood. We believe all who believe they are truly receiving Christ in this meal receive His gifts of forgiveness for our sins, life, and salvation. We welcome to our table all those who have been taught this understanding of Holy Communion and believe this about it as Missouri Synod Lutherans. Do we still hold to the 10 commandments and teach them? We believe the Ten Commandments are part of God's moral law, which still applies to our lives. We teach them in confirmation and church. What do we believe about life after death? We believe all who die with faith in Christ will immediately go to be with Christ in heaven in their souls. Then, on the last day when Christ returns, their bodies will be raised to be reunited with their souls. Those bodies will be transformed in glory to then live bodily with God in His new heaven and new earth after the Final Judgment. As part of the universal Christian Church, The Lutheran Church - Missouri Synod teaches and responds to the love of the Triune God: the Father, Creator of all that exists; Jesus Christ, the Son, who became human to suffer and die for the sins of all human beings and who rose to life again in the ultimate victory over death and Satan; and the Holy Spirit, who creates faith through God's Word and the Sacraments. Being "Lutheran," our congregations accept and teach the Bible - based on the teachings of Martin Luther who inspired the reformation of the Christian Church in the 16th century. 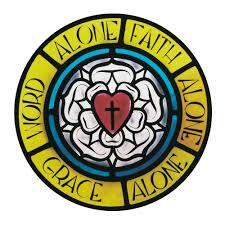 The teachings of Luther and other reformers can be summarized in three short phrases; Grace Alone, Scripture Alone, and Faith Alone. God loves the people of the world, even though they are sinful, rebel against Him and do not deserve His love. Therefore, God the Father out of His love for us, sent His Son, Jesus, down to earth to show us His grace and love by His death on the cross for the forgiveness for our sins. We, therefore, believe we are saved before God through that act of grace alone, as God offers us forgiveness for our sins freely through Christ. The Bible is God's inerrant and infallible Word in which He reveals His Law and His Gospel of salvation in Jesus Christ. It is the sole rule and norm for Christian doctrine. We share in Jesus' saving act on the cross and in His resurrection when we are led through the Spirit to believe in Jesus for our salvation. It means we are not saved or forgiven before God by any merits or works of our own, but purely through a faith that trusts in Christ alone for our salvation.